TSIDE ZEWIDE has lived in the shadow of the national palace in Addis Ababa for more than fifty years. Since her husband died four years ago the 73 year-old has cared for three orphans, the grandchildren of her late sister, alone in a rundown government-owned shack. She has no pension, and, until recently, had no income. “I relied on the kindness of my neighbours,” she sighs. Last year Mrs Zewide’s fortunes changed. She and some 80 of her neighbours rise at dawn to sweep the streets of the Ethiopian capital for three hours a day. For this she is paid 1,200 Ethiopian birr ($44) a month, a fifth of which she must put away in savings. “It’s good for me psychologically,” says. “It keeps me busy, and now at least I can tell people I have a job.” Her teammates nod in agreement. 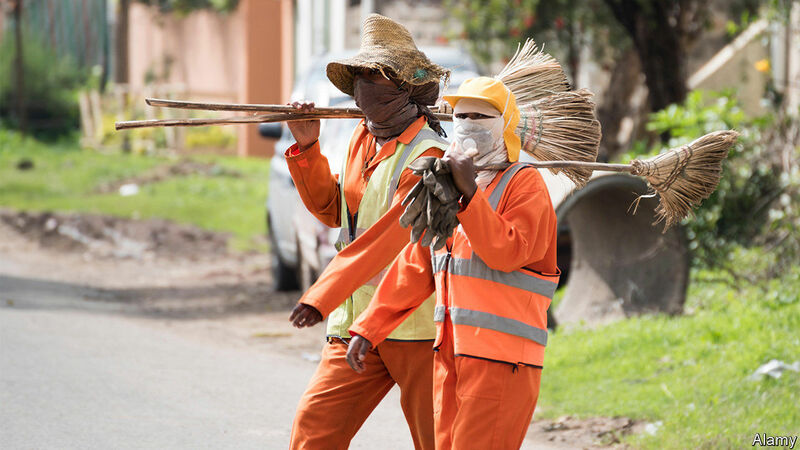 They are participants in Ethiopia’s Urban Productive Safety Net Project, which launched in 2017 and is among the largest social programmes in sub-Saharan Africa (outside South Africa) designed specifically for urban areas. About 400,000 poor Ethiopians in 11 cities are already enrolled, and the government hopes it will eventually help 4.7m people in almost 1,000 towns. Beneficiaries are selected by a neighbourhood committee which chooses the poorest or most vulnerable. In addition to the paid work, they are also giving training. Those who want to start their own businesses are given grants. Safety-nets in one form or another have proliferated across Africa in recent years. Spending on them in sub-Saharan Africa now amounts to about 1.5% of GDP (see chart). In Tanzania 10% of the population is covered by its safety-net (though at a cost of just 0.3% of GDP). Most schemes in Africa are focused on rural people and many are temporary, often implemented by donors in response to natural disasters or conflict. Few are designed to help households manage the private misfortunes—like illness or the death of a family member—that can tip them into destitution. And very few are designed to reduce the chronic unemployment that has taken root in many African cities. Ethiopia’s programme is a step towards building a national social-security system that will, in time, replace a hotch-potch of small ones. It builds on Ethiopia’s flagship rural safety-net, which is the largest of its kind on the continent and covers some 10m poor people in the countryside. The government has committed $150m to fund the new scheme and the World Bank has stumped up the remaining $300m needed for the first five years. Ethiopia hopes that within 10 years it will not need help financing the programme. Ethiopia’s rural scheme, which helps about 10m people (in a population of about 102m), is widely regarded as a success. It has reduced rural poverty and helped the poor buy food during a drought in 2016 that might have led to famine. But towns and cities are a different challenge altogether. It can be hard to know where and who are the very poorest. Applicants must have lived in the district for at least six months to be eligible, so transient urban folk may slip through the net. Mrs Regassa says locals complained to her when they were not selected by the committee. Critics complain that supporters of the ruling party are more likely to get picked. Despite such gripes, Ethiopia’s experience suggests that even poor countries can start extending social safety-nets. If Ethiopia is to achieve its goal of weaning the scheme off donor support, it may have to make cuts to other social programmes, which would be politically painful. The biggest dilemma lies in the fact that even the broadest safety-nets in Africa only cover a small portion of the poor. Mrs Regassa of the local committee is not eligible for help because she owns her own house. But as a single mother with four children—she hopes the programme will one day include her, too.